My wife and I are coming to Boston for St. Paddy's Weekend and need to book our hotel. We're going to the St. Patrick's Day Parade in South Boston and also have tickets to the Dropkick Murphys concert at House of Blues. Can you recommend convenient hotels close to both the parade and HoB? We're flying into Logan so we won't have a car. 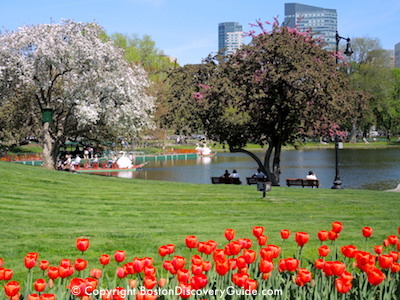 Sure, I'm happy to recommend several Boston hotels that would give you easy access to both the St. Patrick's Day Parade and House of Blues. As you probably already know, the parade takes place in the South Boston neighborhood, and HoB is in the Fenway neighborhood, right across the street from Fenway Park. Even though Boston is fairly compact, these locations are not within easy walking distance of each other. A car would not benefit you for these events, so you are better off not having one. Streets anywhere close to the parade site will be blocked off. Although there are parking garages and lots near Fenway (and House of Blues), they are pricey; in addition, driving in the HoB/Fenway Park area is a pain during events such as St Patrick's Day because the streets will be full of pedestrians - plus streets may be blocked there as well. Fortunately, the parade's kick-off site on West Broadway is close to the subway's Red Line/Broadway station, and House of Blues is only about a 10-minute walk, maybe less, from the Green Line's Kenmore Station. 1) Choose a hotel close to Park Street Station on the edge of Boston Common, where the Red Line and Green Line intersect. You can easily get to both the parade and House of Blues locations on public transportation. 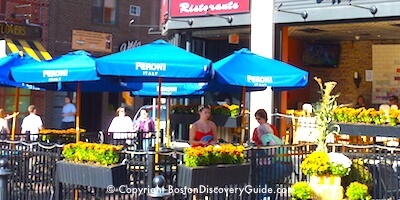 Bonus to this central downtown location: you're close to lots of other popular attractions - the Freedom Trail, Faneuil Marketplace, Beacon Hill, plenty of restaurants and bars, including those around TD Garden where you'll using find plenty of green beer and celebrations. 2) Or ... choose a hotel in the South Boston Waterfront neighborhood, which puts you within walking distance of the parade route. To get to House of Blues, you could take the subway (Silver Line to South Station, transfer to the Red Line and go to Park Station, transfer at Park to the Green Line and get off at Kenmore - it sounds more complicated that it really is). If you don't want to walk to/from the parade (depending on which hotel you choose, it will be about a 15-20-minute walk), you could alternately take the Silver Line to South Station, transfer to the Red Line, and get off at the Broadway Station. Bonus to this location: you're close to the sizzling nightlife along the South Boston Waterfront, plus you can take a water taxi to/from your hotel and the airport. Hope this helps! Have a wonderful time in Boston! Part of the Kimpton hotel family, the Nine Zero Hotel (90 Tremont St.) occupies a wonderful spot just a block from the Park Station. 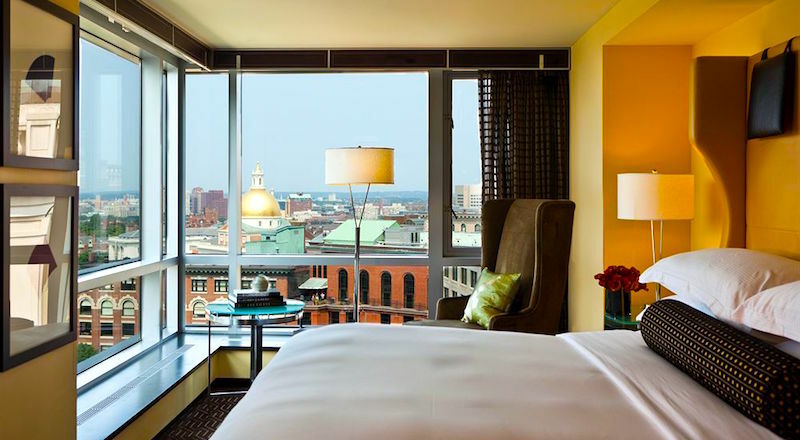 You'll love the views overlooking Boston Common, Beacon Hill, and the golden dome of the Massachusetts State House. This stylish 4-star boutique hotel emphasizes luxury and personal service. Sign up for the Kimpton loyalty program to get complimentary wifi. XV Beacon (15 Beacon Street) caters to well-heeled business travelers and their families. If you're visiting in March, you may still get to take advantage of lower winter rates. This luxury boutique hotel is only slightly farther from Park Street Station than the Nine Zero, and is just around the corner from Faneuil Hall Marketplace in the most historic part of downtown Boston. The stylish Godfrey Hotel (505 Washington Street), located in newly-trendy Downtown Crossing at the heart of the Theatre District, combines sophistication with luxury. In addition to its own top-rated restaurant and coffee bar, it is surrounded by excellent places to eat (Chinatown begins just one block away) and enjoy a drink. It is also just one short block from Boston Common and the Green Line's Boylston station, about a block closer than Park Station. The Envoy offers lovely public spaces and plush, comfortable guestrooms - but let's cut to the chase about what makes it a special place to stay: the rooftop patio bar overlooking Boston Harbor and the city skyline. It is glorious. Like other hotels in this über-trendy neighborhood, it's a little less than a mile from the parade starting point, but it's an easy walk and you'll find a lot to enjoy among the restaurants and bars overlooking the harbor ... if you can pull yourselves away from the hotel's rooftop patio. The upscale Seaport Hotel hosts many conferences and caters to business people who expect the best - which means you'll find a lot to enjoy. There's a Silver Line stop in front of the hotel, which makes getting to South Station (ie, the Red Line) super-easy. A quirky, modern ambiance gives the Residence Inn - Seaport a super-cool vibe, fitting in this neighborhood of old brick warehouses repurposed for some of the city's most innovative businesses. This hotel is in the Fort Point section of the neighborhood, know for its excellent chef-owned restaurants, artist studios, and galleries.